Bloomsday is the only international holiday in recognition of a specific work of art and is celebrated annually on 16 June in Dublin , to commemorate the first ‘dating’ of James Joyce and Nora Barnacle .It is named after Leopold Bloom, the protagonist of James Joyce’s legendary novel Ulysses The first celebration took place in 1954, and a major five-month-long festival (ReJoyce Dublin 2004) took place in Dublin between 1 April and 31 August 2004. On the Sunday in 2004 before the 100th "anniversary" of the fictional events described in the book, 10,000 people in Dublin were treated to a free, open-air, full Irish breakfast on O'Connell Street consisting of sausages, rashers, toast, beans, and black and white puddings. Bloomsday has also been celebrated since 1994 in the Hungarian town of Szombathely, the fictional birthplace of Leopold Bloom's father, Virág Rudolf an emigrant Hungarian Jew. 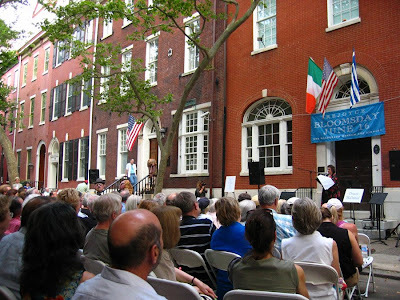 There have been many Bloomsday events in Trieste, where the first part of Ulysses was written; a Joyce Museum was opened there on June 16, 2004. Since 2005 Bloomsday has been celebrated every year in Genoa, Italy, with a reading of Ulysses in Italian by volunteers (students, actors, teachers, scholars) .. I appreciate the idea of celebrating Bloomsday as a public festival , because it is a unique festival whose roots lay in to the work of art ..I adore the day as important as valentine’s day, because it is a social recognition for love and sexuality.